Researchers link obesity to a faulty immune system in animal model. Obesity is a medical condition in which excess body fat has accumulated to the extent that it may have a negative effect on health, leading to reduced life expectancy and increased health problems. Obesity is known to lead to a breakdown of the body’s protective defences, creating the optimal environment for autoimmune diseases; generating a pro-inflammatory environment likely to worsen disease progression. Therefore a lot of attention is now being given to obesity’s interplay with the immune system with a ‘two-way street’ relationship suspected. Now, a study from researchers at Weizmann Institute of Science has identified the particular type of immune cell that caused mice without it to gain excess weight and develop metabolic abnormalities even when they consumed a standard diet. The opensource study is published in the journal Immunity. Previous studies show that certain immune cells help to control fat tissue’s release or storage of energy, therefore the relationship between metabolism and the immune system has received increasing attention over the past few years. Moreover, fat cells produce various inflammatory molecules that can disrupt the balance established by a normal immune system. Because of this, some experts consider obesity to be an autoimmune, inflammatory disorder. The current study showed that the immunological mechanisms that underlie metabolic control of fat tissue the team discovered that mice that lacked certain dendritic immune cells that release a toxic molecule called perforin progressively gained weight and exhibited features of the metabolic syndrome. Results also showed that the animals had an altered collection of T immune cells residing in their fat tissue and depleting these T cells prevented the mice that lacked the perforin-expressing dendritic cells from gaining weight or developing metabolic abnormalities. The lab note that mice lacking these regulatory dendritic cells were also found to be more prone to develop another form of autoimmunity with symptoms similar to those found in multiple sclerosis. The group states that these combined observations suggest that one function of these perforin-expressing dendritic cells is to remove potentially autoimmune T cells, and in so doing, decrease inflammation. They go on to add that while the connection between fat cells and inflammation has already been shown in mice fed a high-fat diet, this is the first time that a study has demonstrated the connection in animals on a regular diet, simply by eliminating perforin-expressing dendritic cells. The team conclude that their findings indicate that perforin-expressing dendritic cells are critical for protecting against metabolic syndrome and autoimmunity, and shifting the abundance of these cells in relation to other immune cell populations may help prevent or treat such conditions. The researchers surmise that it is hard to predict how this might impact patient care. However, for the future they now plan investigate if the absence of this rare subpopulation of cells is associated with obesity, metabolic syndrome, or any autoimmune or other immune abnormalities. Emerging evidence suggests that immunological mechanisms underlie metabolic control of adipose tissue. Here, we have shown the regulatory impact of a rare subpopulation of dendritic cells, rich in perforin-containing granules (perf-DCs). Using bone marrow transplantation to generate animals selectively lacking perf-DCs, we found that these chimeras progressively gained weight and exhibited features of metabolic syndrome. This phenotype was associated with an altered repertoire of T cells residing in adipose tissue and could be completely prevented by T cell depletion in vivo. A similar impact of perf-DCs on inflammatory T cells was also found in a well-defined model of multiple sclerosis, experimental autoimmune encephlalomyelitis (EAE). Thus, perf-DCs probably represent a regulatory cell subpopulation critical for protection from metabolic syndrome and autoimmunity. 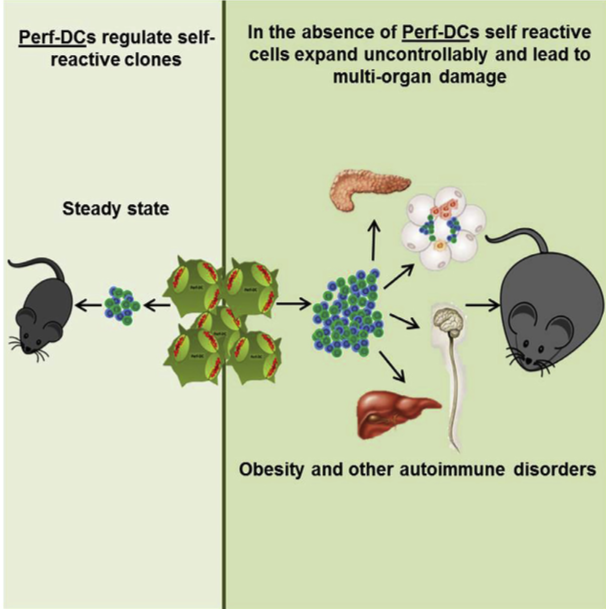 Perforin-Positive Dendritic Cells Exhibit an Immuno-regulatory Role in Metabolic Syndrome and Autoimmunity. Reisner et al 2015.